Viele Lake at Harlow Platts Park is a small community park lake in a residential area of Boulder, Colorado. The lake lies next to Fairview High School in South Boulder, just down the hill from the NCAR Mesa Lab, and in the shadow of Bear Mountain. 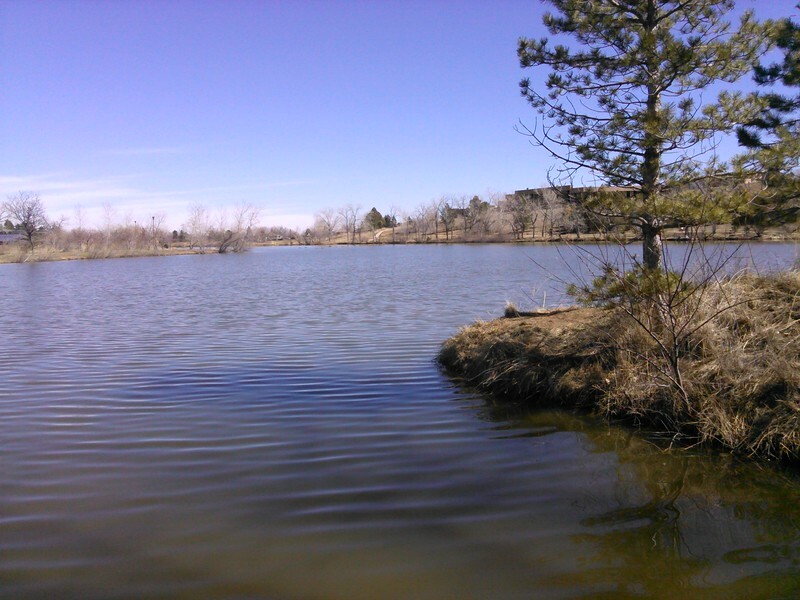 During Spring and Summer, I fish this lake very often as it is so close to my work at NCAR. There is also a paved path of about .6 miles around the lake that I often run, but that is for other posts. Map to Viele Lake. In the past, I have had success at Viele Lake fishing for bass, crappie and sunfish using mini Rapalas and crankbaits, and I have seen other fishermen with a stringer full of trout caught on PowerBait. I have also seen huge carp, and flyrod fishermen seeking them, though never with success. The largest bass I’ve caught at Viele Lake is probably only a pound or so, and that is rare. The lake is small and shallow and doesn’t support any large bass. It can easily be fully fished in an hour or so. There are always many geese about the lake, and they’re not always happy when you infringe upon their territory. Since Viele Lake is next to Fairview High School, there are often gaggles of girls and mobs of boys cavorting around the lake during lunchtime on school days. They don’t often get in the way of the fishing, but occasionally the boys will throw objects right where you are casting, or the girls will be occupying a prime spot near the bank. There is also a disc golf course, a playground and the South Boulder Recreation Center at this park, so there can be quite a bit of traffic around the lake. In all my experience though, everyone is friendly and some are curious about the fishing. If you see a cheeseball, pick it up!